President Trump held a ceremonial swearing-in Monday at the White House for Brett Kavanaugh, who was already sworn in Saturday to the Supreme Court. Mr. Trump briefly addressed the crowd in the East Room of the White House, and began by apologizing to Kavanaugh and his family, who joined him on the stage. "On behalf of our nation, I want to apologize to Brett and the entire Kavanaugh family for the terrible pain and suffering you have been forced to endure," Mr. Trump said. Former Justice Anthony Kennedy, whose retirement paved the way for Kavanaugh, administered the judicial oath for a second time. In his remarks, Kavanaugh said that he held "no bitterness" over the brutal Senate confirmation fight, during which he was accused of sexual assault by three women and railed against Democrats opposed to his nomination. "The Supreme Court is an institution of law. It is not a partisan or political institution. The justices do not sit on opposite sides of an aisle. We do not caucus in separate rooms," Kavanaugh said. "The Supreme Court is a team of nine, and I will always be a team player on the team of nine." Kavanaugh said he was proud his newly hired law clerks are all women, a first for a Supreme Court justice. "I've worked hard throughout my career to promote the advancement of women," he said. The Senate confirmed Kavanaugh in a 50-48 vote Saturday, when Mr. Trump was en route to Kansas for a rally. 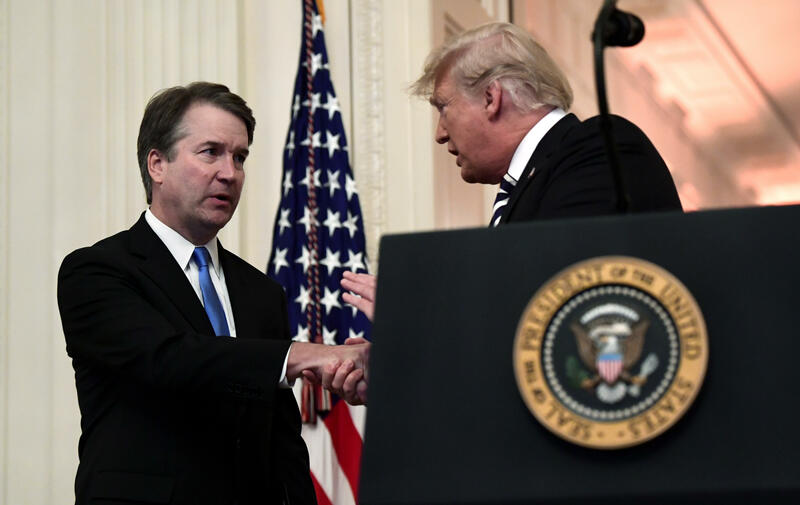 Kavanaugh was officially sworn in that evening at the Supreme Court by Chief Justice John Roberts and Kennedy. Mr. Trump has continued to laud Kavanaugh's character and intellect, following allegations of sexual misconduct that roiled Kavanaugh's confirmation process for weeks. Earlier Monday, the president said "evil" people brought about the situation that slowed Kavanaugh's confirmation. What happened to Kavanaugh was "very, very unfair," the president lamented. "False charges. False accusations," the president said at a convention for police chiefs in Orlando. "Horrible statements that were horribly untrue that he knew nothing about. Frankly, terms that he probably never heard in his life. He was this. He was that. He never even heard of these terms. It was a disgraceful situation brought about by people who were evil. And he toughed it out."